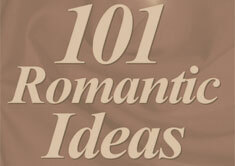 Creative Ways to Celebrate Valentine's Day? Creative Ways to Celebrate Valentine's Day? When my husband came home from an extended business trip, the first thing he saw when he came through the door, was I LOVE YOU spelled out with the kids big plastic blocks on the floor just inside the front door. When he went to take a shower there was another message on the wall, I MISSED YOU, spelled out with foam letters that stick to the wall when damp. And on the refrigerator was another message made with the magnetic words. Having the kids toys spread around isn’t a bad thing when they tell him how much you care.